The right strength. The purest oil. Why True CBD Hemp Oil? True CBD Hemp Oil is 100% Hemp. Not blended with other oils. Free from additives and preservatives. No flavorings. All our oil is formulated to be used both internally and topically! For Internal use take drops sublingually (under the tongue). 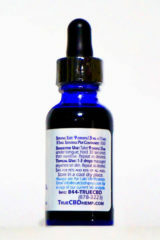 For topical use simply apply a few drops to your skin and massage in. Avoid eye contact. Not a vaping oil. High-pressure liquid chromatography by ProVerde Labs ensures that EVERY batch of True CBD Hemp Oil is free from contaminants and has accurate and consistent Cannabinoid and Terpene Profiles. Sold by Physicians and in Stores across the U.S. Contact us to find a local health & wellness retailer near you. 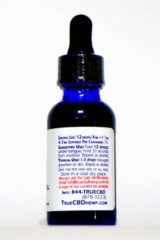 True CBD Hemp Oil is always 100% Hemp. No Vegetable Glycerin, No Cheap Carrier Oils, No Polysorbate 80, No Flavorings or Preservatives. No Competitive Ingredients. Just 100% Pure Hemp. 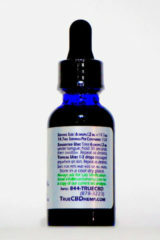 True CBD Hemp Oil was created with purity, potency and convenience in mind. In a 1oz bottle, True CBD Hemp Oil provides multiple strengths of 150mg, 350mg, 1100mg or 2200mg of CBD, as well as an impressive terpene profile and a full spectrum of other trace cannabinoids including CBC, CBD, CBG, and THC. 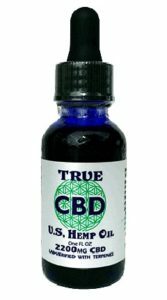 True CBD Hemp Oil can be taken internally by using it sublingually (held under the tongue for 30 seconds), and/or used topically (just a few drops applied anywhere on the skin – careful to avoid eyes). Every Batch of True CBD Hemp Oil is tested by 3rd Party, (ProVerde Labs), for purity and potency by being analyzed through a High-Pressure Liquid Chromatography (HPLC) test for aerobic organisms, yeast, fungus, E. coli, and heavy toxic metals. When you’re considering using Cannabidiol (CBD) oil as a dietary supplement the potency and purity are critical to the impact that it will have. That’s why we test EVERY batch and don’t simply rely on Organic Certifications provided by companies who profit from doing that certifying. We have EVERY batch tested ourselves! Please email info@truecbdhemp.com for a copy of our most up to date lab work. 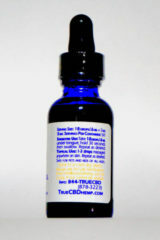 If you have questions about our CBD Hemp Oil products, please don’t hesitate to reach out. We believe that the more you know and understand the power of cannabinoids the better choices you can make.